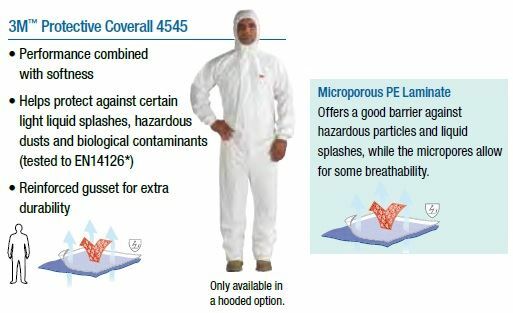 The Coverall 4545 is made of a high quality laminated material. 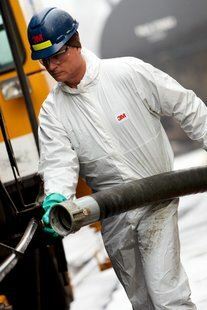 It provides barrier protection against hazardous dusts, light liquid splashes and certain biological contaminants. Knit cuffs provide a soft wrist closure (not elastic closures) for increased comfort. Reinforcement gusset between the legs, it's increase durability during bending and squatting. Two-way zip closure with salable storm flap. 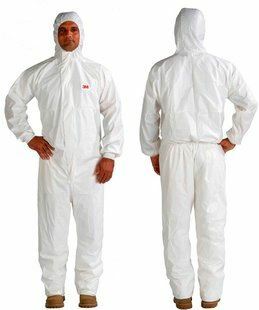 Disposable Protective Coverall 4545 made with anti-static coating on both sides which helps to reduce static build-up and prevent the risk of static discharge. 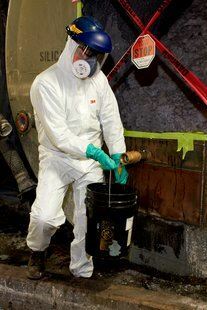 3M Disposable Protective Coverall 4545 Type 5/6 Standards: EN 14126 - Infective Agents (Biohazard), EN 1149-5 - Electrostatic Properties, EN 1073-2 Particulate Radioactive Contamination, EN 13034:2005+A1:2009 Type 6 Liquid Splash, CE Category III, EN ISO 13982-1:2004 Type 5 Hazardous Dusts. Anti-static coating on both sides. Discover more our products - Pioner Coveralls. Explore our products and Safety solutions in our By Profession Category.